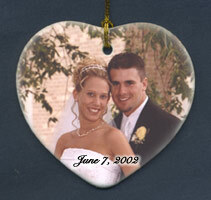 Personalized ornaments and gift items can have a full color image or can be etched with one of our designs, or text, a photo, image or logo you provide. 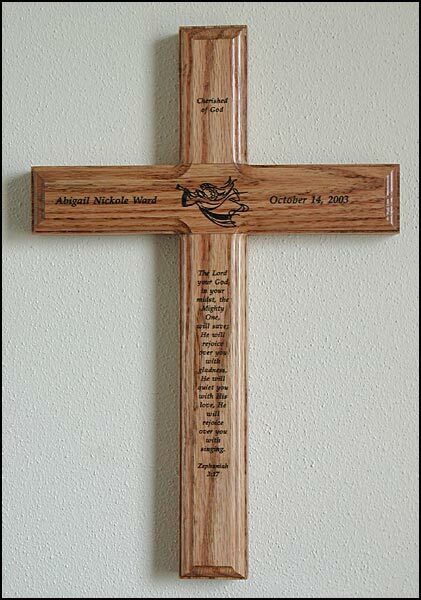 You can have an oak cross or desk clock customized with text, clipart, or logos. 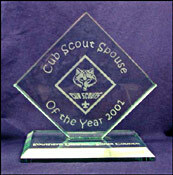 We also have a variety of glass awards and shapes that can be etched with a photo, logos, or personalized with names and dates. 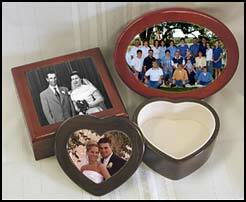 A photograph you send can be printed or etched onto an ornament, jewelry box, or other gift item. The photograph is not damaged and will be returned with your finished item. See the photo information page on how to send us your photo. If you have an item(s) you would like for a special occasion, please contact us. 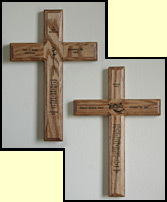 We can also customize our handcrafted clocks, benches, and mirrors, with photos, logos, and personalizations. 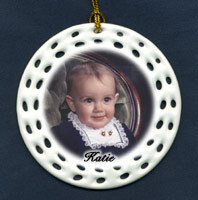 Any clear picture, image, or design, whether black and white or colored, can be put on a porcelain ornament. If you are sending an image or design through the mail, please protect it from getting bent. The photo is not damaged and will be returned. Text can be added. Some shapes can have text or photo on the back also. We can use digital photos and scans. See the How to Send Images and Photos page for instructions. If you have any questions, please contact us. We can also make ornaments for special events or occasions such as corporate gifts or collectibles for organizations and fundraisers. Contact us for quantity discounts. 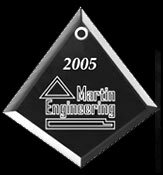 Etched glass ornaments come in different shapes which can be etched and personalized with a photograph* you provide or one of our designs. Any clear picture, whether black and white or colored, will work. A glossy print will give better results than a matte print, but either will work. If you are sending a photo through the mail, please protect it from getting bent. The photo is not damaged and will be returned. We can use digital photos and scans. See the How to Send Images and Photos page for instructions. If you have any questions, please contact us. We can also make ornaments for special events or occasions such as corporate gifts or collectibles for organizations and fundraisers. Contact us for quantity discounts. Diamond - 3 1/2" x 3 3/8"
Octagon - 2 3/4" x 3 3/8"
You can choose a font from this list for your text. We do have other fonts available, if you would like something else please contact us. 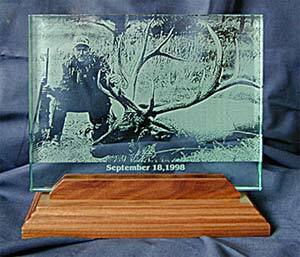 We have a number of other glass gift items, trophies, and awards that can be custom etched or personalized with a photo and/or text. Choose one of our designs, or an image or photograph you send can place on a clock, jewelry box, or other giftware. Other glass items available through www.PrismProduct.com or other glass suppliers can also be used. 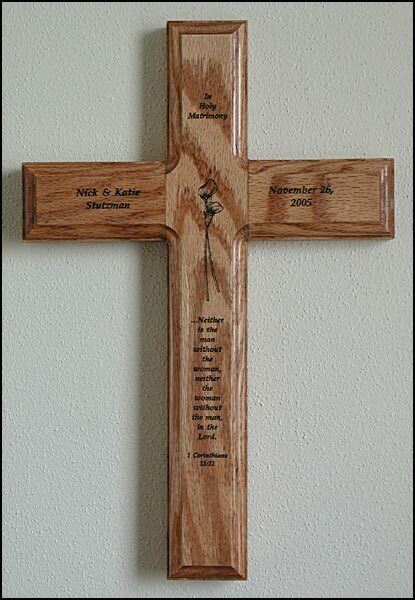 Contact us with information on the item you would like ordered and custom etched for a price quote. 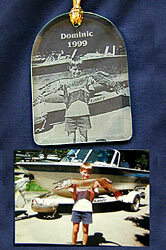 Photos can also be etched or printed on the wood and glass clocks we manufacture. See the clocks page for more information. Any clear picture, image, or design, whether black and white or colored, can be put on a porcelain tile that insets into the box lid. Boxes are fully lined. Rectangle box has a hinged lid. Heart and oval have lift off lids. If you are sending an image or design through the mail, please protect it from getting bent. The photo is not damaged and will be returned. Text can be added. We can use digital photos and scans. See the How to Send Images and Photos page for instructions. If you have any questions, please contact us. Click Here for More Information & Pricing. 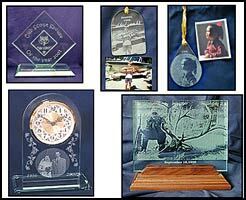 Etched Glassware makes a great collectible or gift for someone special. 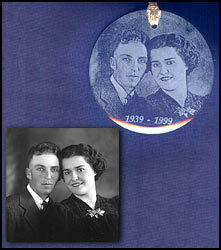 Create your own ornament or limited edition collectible for your family or organization. *We reserve the right to refuse orders using photographs we decide are inappropriate.